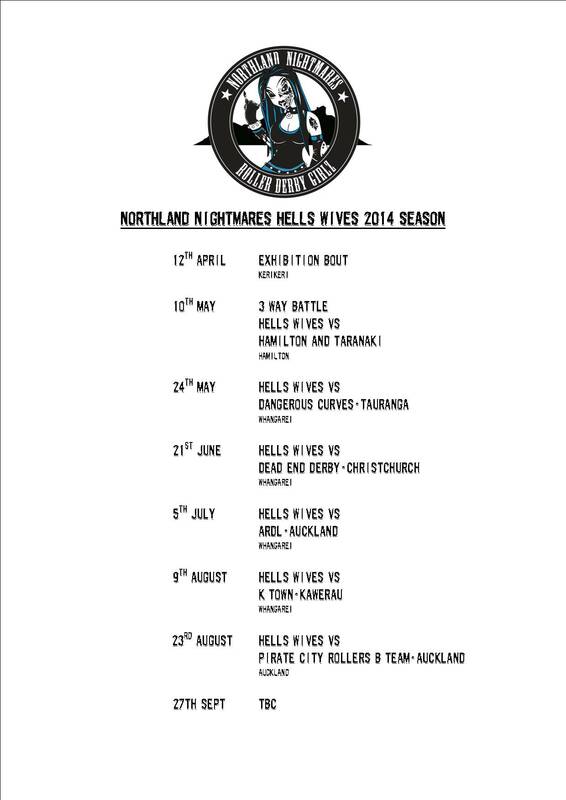 Northland Nightmares have finalised their Hells Wives 2014 season and its looking to be an epic year of serious derby action at home and away! We start off with an exhibition bout in Kerikeri for our fresh new players to pop their derby cherries after passing their skills testing and then its off to Hamilton on 10th May for a 3 way battle against the Hellminton Roller Ghouls Raggedy Angst and the girls from the Taranaki Roller Corps, that’s sure going to be a tough day! Our first home game at Kensington Stadium is a grudge match of legendary proportions – Hells Wives vs Mt. Militia’s Dangerous Curves, we consistently swap victories with the Militia Crew with us losing our last game against them in Derby Royale awarding them the second division trophy – pressure much? On 21st June we face a real test against one of the best and slickest teams in the country, Hells Wives vs Dead End Derby from Christchurch (DED), we have never met DED in anger but know we will have to work very hard to come out on top, we cant wait to welcome our South Island sisters to the winterless north! The 5th of July will see us up against one of our old foes – Auckland Roller Derby League (ARDL) – these girls are some of the best Derby players you will see, we have, however, managed to give them a few tiny scares in the past, so who knows? maybe David will be victorious against Goliath this time? The 9th of August will be another grudge match up here in Whangarei – at Derby Royale we were knocked out of the first division by K-Town (Kawerau), coached by the NZ Roller Derby team coach Pieces of Hate, K-Town showed NZ derby what the underdog can do with lots of hard work and persistence – an inspiration to us Northland girls! AAAAARRRRRR Shiver me Timbers! We head away from Whangarei and down to the City of Sails (and pirates!) on 23rd August to play the Pirate City Rollers B Team, we have never played against the league a few of our members used to play with and a lot has changed since those early cut throat days. Pirate City Rollers are NZ’s founding Roller Derby League so needless to say these girls know the ropes! We will finish off the year on 27th September with a home game at Kensington Stadium, either a fun exhibition bout or with any luck another team may feel the need to try their luck, we say…………..BRING IT ON! This entry was posted on March 13, 2014 by nnderby. It was filed under EVENTS! .